God’s love for me, for us, human beings is a key inspiration in my faith in Jesus Christ. God is love and Jesus is the incarnation of God’s love. I pray that comes through in this blog and in my life, if you know me personally. That God loves the likes of me not only never ceases to amaze me, it keeps me going in life that I’m not often very good thriving at. In fact, that I thrive at all is entirely due to the Lord – merciful, forgiving, loving..
God’s “love” for me, for us, is a major theme of my writing and in these ornaments. Christmas is sometimes expressed as “Love came down” in the person of Jesus, the season’s reason, right? Than last December, one of our pastor’s Advent messages suggested that Jesus is NOT the reason for the season after all! On December 13, 2015 Grace Chapel pastor Doug Walker opened his third, “Simply Advent” sermon with the story of the Christmas shepherds. He noted they were not waiting or looking for a Messiah at all that night, just going about their work shepherding sheep. Their night and lives changed when an angel appeared to them to announce a “joyous” birth of a Savior, their Savior. No mention next of them wondering why the angel said this baby was their Messiah, only that they hurried off to Bethlehem and, well, the rest is history. Jesus is the reason for the season, right? The Gospel explains Doug’s rationale. Sin broke humanity’s connection with God so badly that only a perfectly acceptable sacrifice could repair the breach. Jesus was that perfectly acceptable sacrifice, sent by God for us. Wow! If we are the reason for the season, doesn’t that change the premise of Christmas gift giving? No longer is it about commemorating the gifts given to baby Jesus. Rather, gifting extends the gift of Jesus that God gave to us!. “However,” cautioned Doug, “An item that is offered as a gift only becomes a gift when received by the intended recipient. Likewise, Jesus’ salvation only applies for those who receive Him as their Savior and Lord. Like the shepherds were not looking for a Savior that night and were unaware of their need for one until after they “met” Him, most of us are like that too. We go about our lives with hopefully few needs but many wants. How high is Savior/Messiah on our gift list? Doug’s message brought to mind when I received Jesus as my Savior. Before I gave into belief, I had no sense of needing a Messiah/Savior either. Only afterwards did my need to be saved dawn on me. Christmastime brings out our gift lists, our wants. However, wants only stoke desires while needs starve well-being. Desires are rarely satisfied but met needs sustain us for today and beyond – perfect description of salvation, a need met for today and beyond. Consider that God was much more concerned about the breach in His relationship with us than we are or were. He knows we need Him, that He is the key to our lives, so He stepped in to repair the breach caused by our sin by sending His Son, Jesus to become the only sacrifice that would be acceptable to Him, the one and only God. God made us the reason for the season in the hope that we would receive His gift and would, in turn, make Him the focal points of our lives. Those of us who receive the gift of Jesus may now share Him and His salvation with others. That’s what I am doing with this little ornament, sharing the good news of Christ’s salvation with people I care about. Once I was a grateful recipient, now I am a Gift giver. What an amazing reason for a season! COMMENTS: Are WELCOME and ENCOURAGED here about how the ornament and/or message struck you ESPECIALLY from ornament recipients. IF YOU WOULD LIKE TO RECEIVE a 2016 “Reason for the Season” ornament, simply request one. Limited supply of extras so no guarantees but if I can get one to you, I will. If shipping is required, I will ask you to cover those costs. To Doug Walker, Pastor of Grace Chapel Church in Farmington Hills, MI whose message on 12/13/2015 inspired this and several other of my ornaments over the years. Doug, I cherish your faithfulness to the Gospel and friendship and support of me. Honorable mention to fellow Grace Chapel member, Rick Neal who read his poem “My Christmas Want” at that 12/13/2015 service, the theme of which also bolsters this ornament’s “Reason for the season” idea. Thanks also to Grace Chapel Office Administrator, Karol Gee for help with printing my ornament labels and card. 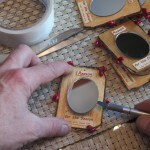 While the idea for this ornament came early, it wasn’t a go until I found the nifty little mirrors at Consumer Crafts. With those in hand, all systems were go. Finding the just-right-sized ornament body (“unfinished wood sign cutout”) at Factory Direct Craft was also a huge time saver. The “Blooming Pepper Berry Garland” from JoAnn Fabrics was a nice “framing touch” suggested by my wife, Cindy. The anchor scriptures printed as a label on the back of the ornament are:a) Isaiah 9:6 (NIV): For to us a child is born, to us a son is given, … And he will be called Wonderful Counselor, Mighty God, Everlasting Father, Prince of Peace. ; b) Luke 2:11 (NIV) Today in the town of David a Savior has been born to you; he is the Messiah, the Lord.